Recent Tabs feature in Google Chrome is very useful specially when you want to recover accidentally closed website tabs. It helps you open and restore recently closed website tabs in Google Chrome. You can browse list of recently closed tabs and open back specific tab or all tabs as per requirement. In new Google Chrome version 29 and above – this feature has been re-positioned to Chrome’s Settings menu. 1. In your Google Chrome browser, click on dash button at upper right. Then goto Recent Tabs and open any listed website tab. By default, it will show list of all website tabs that you have closed recently during current browser session. If you close or restart Chrome browser, recent tabs list will be set to blank. 2. You can also open last recently closed tab using keyboard shortcut Ctrl + Shift + T keys. 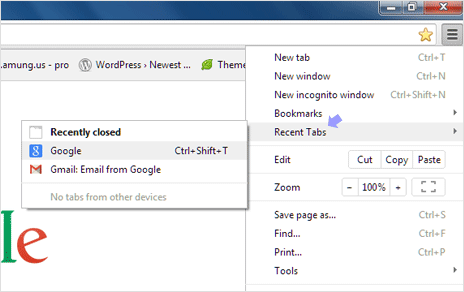 Using these methods you can restore last recently closed tabs in Google Chrome browser. For users with older version of Chrome, check the method discussed in second part of the article. 1. Launch a new tab in Google Chrome browser. It will show website screenshots of last opened tabs. Look for Recently Closed bar at the bottom of Chrome window. It shows last 5 closed tabs in Google Chrome browser. 2. 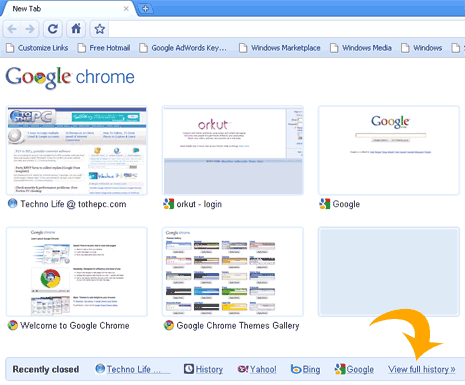 Click View Full History button to see detailed list of websites opened in recently closed tabs in Google Chrome. From the list, you can restore any last closed tab in Chrome browser. This is no longer available as of the 29.0.1547.76 Version. Anyone knows where to find this in the latest update? Cool! thank you for sharing. Looking for this function for a long time. yeah I accidentally deleted one of those boxes to get to other tabs how do I get it back? Yeah… This feature has helped me a lot. Not just when I closed the browser window. But also when I accidently close the wrong tab.